Kendra Thomas is an up and coming fashion-customizer & designer-toy-customizer who is making heads spin with her bright colors and stunning realism pieces. We’ve seen Lisa-Frank style work, galaxy paint that is hypnotically elaborate, flower detail, and epically realistic animals and now she’s brought this out from her studio and we are in awe! Her “Protector of Spirits” looks into the beauty of a land and time long forgotten where humanity searched the heavens for guidance and protection and found hope in the goodness of nature and the communion between man and beast. Taking Tara McPherson and KidRobot’s already spectacular piece and giving it a realistic spin that harkens to the indigenous peoples who are so rarely represented in popular art, Kendra creates an eye-catching duo. This young girl and her dire-wolf show the level of detail and patience Kendra puts into her work. The brush strokes on the wolf come together to present a beautiful coat, with stunning blue eyes peeking out softly. The young girl’s tribal tattoos and feather-adorned hair combined with her delicately painted dress convey a sense of innocence and power all at once. 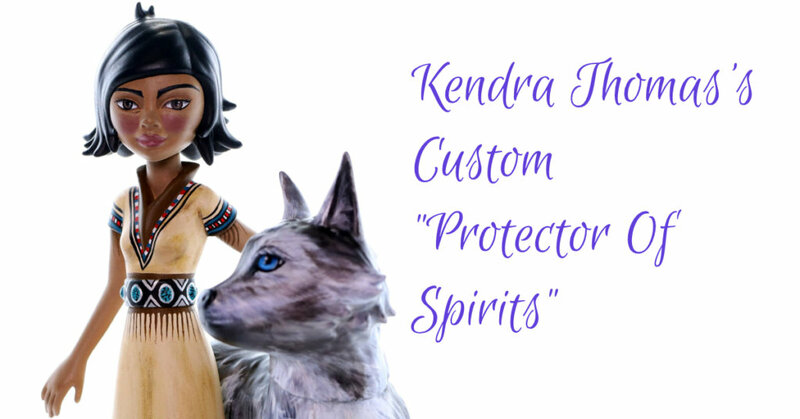 While we are unsure of when and where this will release for certain, Kendra announced on her facebook that it may be up for grabs at DCon and that she will announce (we assume that it will be via Facebook) the final decision soon. Make sure you follow her so that you can get the newest updates!